The Games We Played – Julius Erving & Larry Bird: One-On-One (C64) | OhGizmo! It seems that if you want to guarantee your sports title has some level of success these days, you need to make sure it features a professional athlete in some capacity. But believe it or not there was a time when game developers didn’t shell out millions of dollars to license actual players. 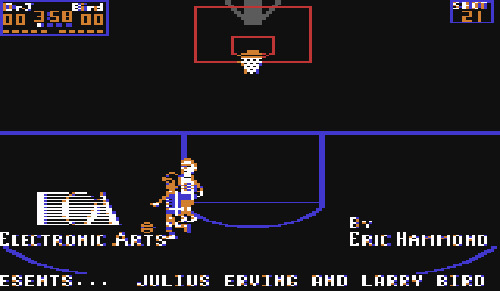 In fact the first game to feature sports celebrities didn’t come out until 1983 when a then small company known as Electronic Arts released Julius Erving & Larry Bird: One-On-One for the Commodore 64. While the in-game characters looked nothing like their real-life counterparts, the box featured a photo of both NBA stars on the front which pretty much guaranteed the game would appeal to even the most passive of basketball fans. As you can see the graphics were particularly bland, even for a Commodore 64 title, but the background music was quite addictive and the gameplay was pretty decent. One thing I never really liked though was that the players got tired as you approached the end of each quarter. As a result they would start to move as slow as molasses, so we’d usually just put down our joysticks and let the clock run out until they were back to full speed at the start of the next quarter. I’m sure the feature seemed like a clever idea on paper, but it became quite tedious when you were actually trying to play the game. And to be honest, the sports celebrity angle was never the reason my friends and I played the game. In fact as grade school kids we barely knew who Dr. J or Larry Bird even were. But we loved their game for the simple fact that you could shatter the backboard with a slam dunk. You never knew when it was going to happen, but when it did the backboard would turn into a pixelated mess as it fell to the floor, and a disgruntled janitor would have to come out and sweep it up before the game could continue. It was actually a very small part of the game, but as far as my friends and I were concerned, shattering the backboard after a dunk was probably the greatest accomplishment any NBA player could pull off in their career. And it was just as satisfying for us to do it sitting in front of our C64s. I don’t remember ever playing that game, Jordan vs Bird maybe. i remember playing this, but i played it on my apple II. i LOVED when that backboard shattered! and i loved sinking far away shots as larry bird. but i have to say, seeing these screenshots…man, this game looked a lot better when i was younger, haha. i didn’t realize how pixelated everything was. Ooh man! I just played it a couple months ago when I brought out my old Colecovision. The Coleco version did not have music, but it was still fun to play. I recall a buddy of mine and I used to ditch high school to go play it at his house.